The musculoskeletal structure of the chest wall serves to protect the thoracic and mediastinal viscera, while providing integrity for respiration. The complex relationship of all anatomic components contributes to its function but also makes it susceptible to a wide variety of pathology. Thus, tumors of the chest wall represent a diagnostic and therapeutic challenge. Chest wall masses have a broad differential diagnosis including local extension of intrathoracic lesions, presentations of systemic diseases or inflammatory processes, metastasis, and less frequently, primary tumors of the chest wall, which can be benign or malignant. More than 50 % are malignant and are most commonly a result of direct invasion or metastasis from adjacent thoracic tumors . Overall, primary chest wall tumors make up less than 5 % of thoracic malignancies and vary widely in pathology, as they arise from all anatomic structures comprising the chest wall [2, 3]. 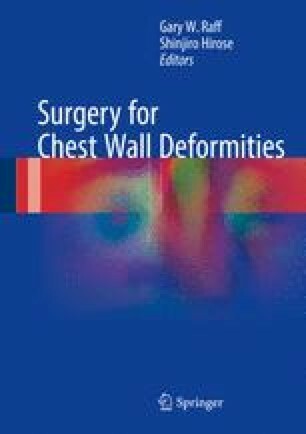 This chapter reviews the pathology, options for diagnosis, and standard treatment of the various lesions arising from the chest wall.